Thanks! Hopefully it will be awesome. I will make it so! Ibrahim stop being grumpy! Little stepbrothers don’t understand the concept of researching for fun. But if he tells me a story I will love him forever. Also Sarah expect my Tumblr to be filled with hipster Ibrahim by the end of the month. I’m in love. Haha! I look forward to it. XD Ibrahim doesn’t, but oh well. Which kid? They’re all kids! Even Ibrahim, the little goober. Haha, thank you! That would definitely be cool. Can… can I voice-act Hedda? It would be a dream come true. Wheeew! Just blasted through the archives and now in the position of only one update a week. 🙁 Great stuff, great art, etc. etc. Aw, thank you! I’m glad you enjoyed it. I know the update is slow, but it is what it is. Haha, maybe? I have no idea honestly. I just picked Plato because it was a well-known philosopher’s name. 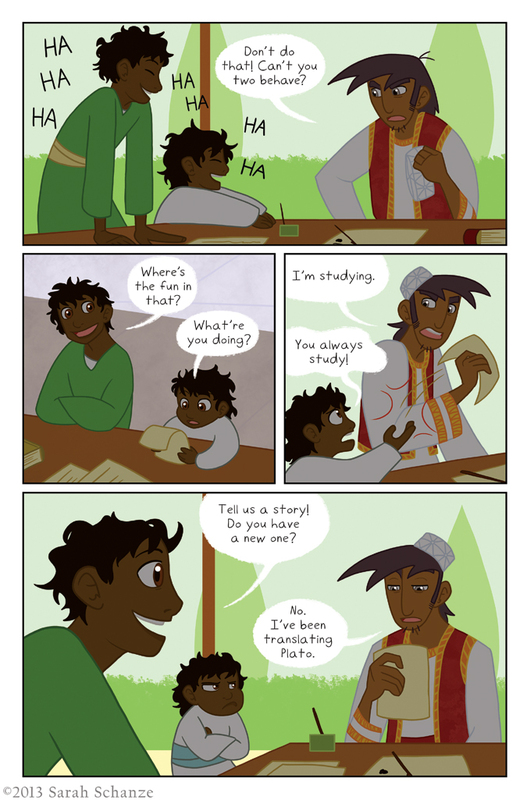 >3> If he did write stories I dunno if Ibrahim’s sibs would want to hear them! Haha! Yeah it’s no big deal for Ibrahim, master of languages, especially old ones! I was all like where’s his hat in the first panel for a second there. Man o man I wonder if his translation is one of the ones that survives! Hahaha, the kids scared it off his head! So evil. Actually Plato was quite ignored by Spanish medieval muslims, but they studied Aristotle far more; in fact, Europe culture could read Aristotle’s works thanks to muslims translations by Averroes and Avicenna, the two main muslims phylosophiers in medieval Europe back then.